and for anyone who wants a reminder that family comes first and comes from a place of love! The Angel of Families helps us with those inevitable conflicts that tend to arise in even the best of families. She reminds us that the surest way to resolve any conflict is first and foremost to come from a place of love. Everyone responds better when treated with loving kindness. If the wounds are deep and you need time to heal, take it. Allow others to take the time they need as well. And remember, there is nothing you need do alone. The angels are only a breath away . . . all you need do is ASK and they will gladly comfort you in any way they can. 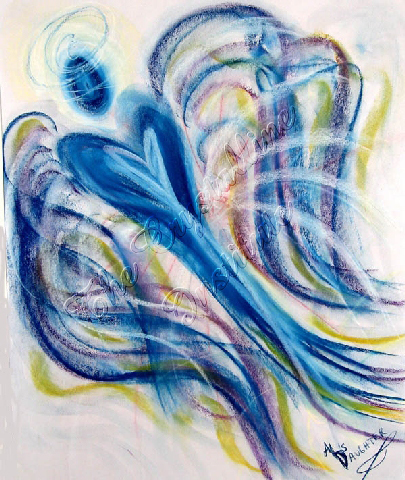 This beautiful angelic artwork, was created by Visionary Artist and Angel Communicator, Lori Daniel Falk, to remind us that the surest way to resolve any conflict is first and foremost to come from a place of love. Everyone responds better when treated with loving kindness. 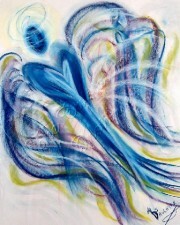 Pastel Chalk on paper.